A group of 15 women sit in a circle on benches under the mango tree. Two women sit in plastic chairs, asking questions, encouraging the group members to express their opinions and ask questions. The women talk about difficulties on their farms, problems in their families, the recent flooding of a nearby river and plans for their farms. One of the women in the chairs is the Chairperson of the group. 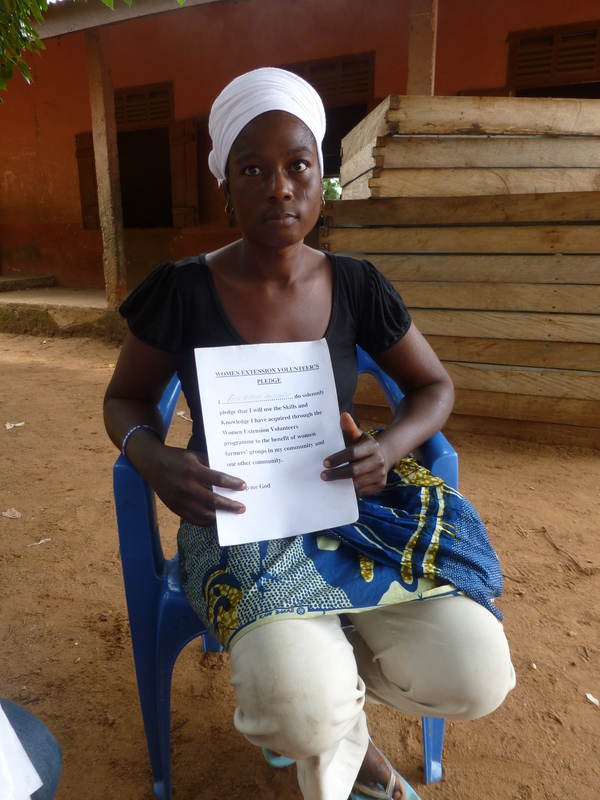 The other woman explains that a Non-Governmental Organisation (NGO) has come to the community and offered to provide the women with a shea butter processing machine; they will just need to build a structure for it. She leads them in a discussion of where they will build the structure, where they will get the materials and who will do the work. They are happy and excited about the news of this machine which should help reduce the labour in processing shea butter. This second woman is the group’s Woman Extension Volunteer (WEV). For some time, agriculture and extension policies and research have focused on female farmers and their access to agricultural and rural advisory services. Women are a critical part of the agricultural sector in developing countries, but studies have shown that they have less access to the resources required to be productive and successful farmers 1. One of these resources is extension services (or agricultural advisory services). In fact, the FAO estimates that women have access to only 5% of extension services worldwide2. This percentage is estimated to be slightly lower in Ghana, with women accessing only 4.3% of extension services 3. 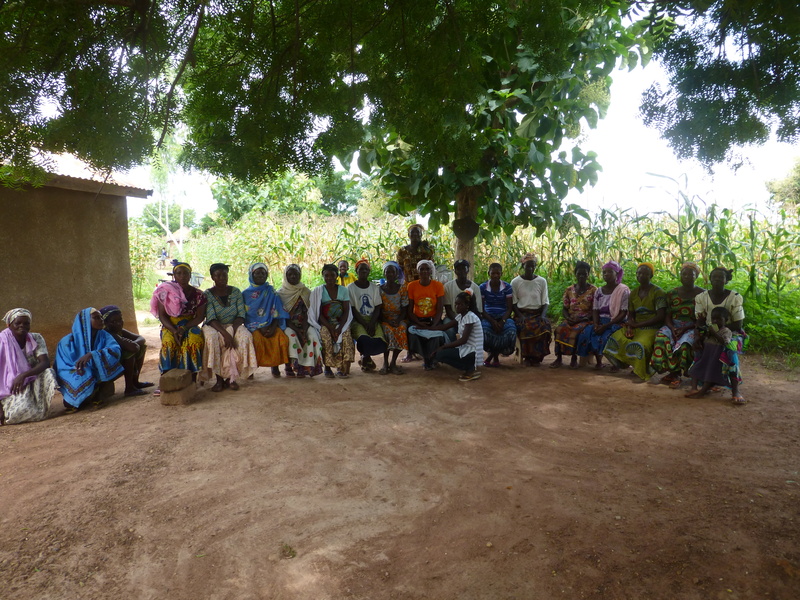 In 2008, VSO Ghana in collaboration with the Ghanaian Ministry of Food and Agriculture (MoFA) developed the Women Extension Volunteer model to help increase extension services to female farmers in Northern Ghana. Women were chosen by MoFA agricultural extension agents (AEAs), community members and farmer groups to receive training on basic agricultural practices as well as training in health and sanitation, income generating activities and leadership skills. These women then work in two communities (their own and one other) with farmer groups. They play a role in leading, maintaining and strengthening the groups, training the farmers in these groups and offering advice on farming and other rural issues. They also work closely with the AEA assigned to their area, helping to mobilize farmers for meetings or demonstrations, supplementing the agent’s activities and participating in MoFA activities in the community. 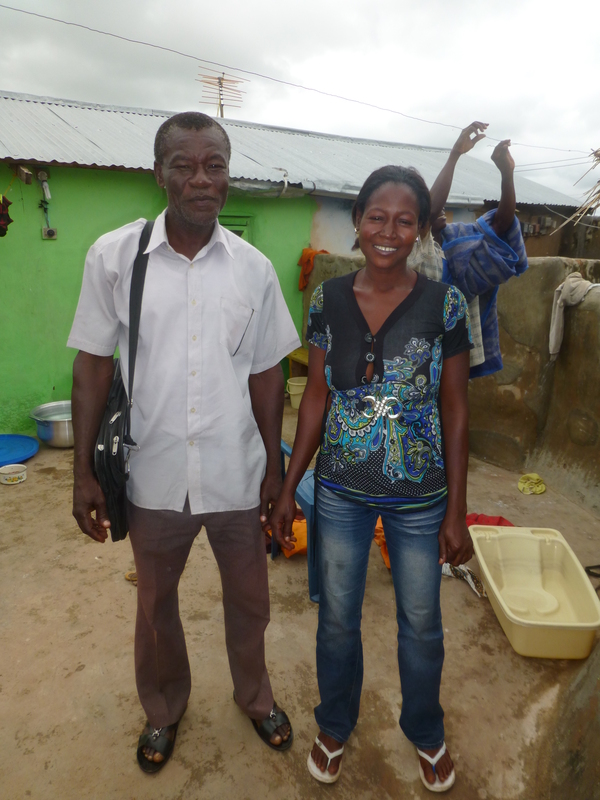 Male extension agents also rely on the volunteers particularly when they want to interact with female farmers. This is crucial as only 15% of extension agents worldwide are women, and only 10% in Ghana 4. They feel that the presence of the volunteer helps to address the socio-cultural gender norms that can make it difficult for male AEAs to interact with female farmers. The presence of the volunteer, who is in an official capacity, helps to break the ice for the women farmers, puts them at ease to communicate and interact with the agent. There are currently volunteers in most districts throughout the 3 Northern Regions of Ghana. VSO is working with MoFA to expand the program to more communities in the Northern Region as well as to other regions of Ghana. Who is a Women Extension Volunteer? 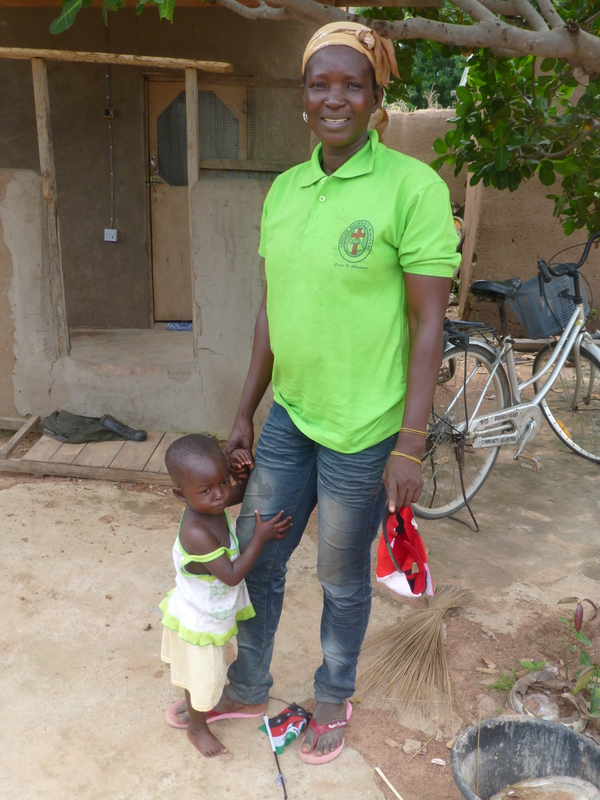 Alice, a volunteer in the Bawku West district. I stayed with her family for a week while I did my research in the area. Community-Based| Volunteers are working in the communities in which they live, they have strong trust and respect with the other female farmers locally. Being farmers in the community themselves, the volunteers are able to demonstrate good agricultural practices. Not only are they telling their peers about these practices, but they are adopting these practices. Peer This also means that they are very accessible, they are in close proximity to the farmers that they are trying to reach, making transportation less of an issue. However, transportation to their second community does present a problem. They were originally given bicycles to facilitate their work in the neighbouring community, but without any maintenance, many, if not all, of these bicycles are broken or stolen. From my research, I saw that women are more active in their own communities than their second partner community. Pamela, a woman extension volunteer, and Frank, the AEA responsible for this community. Just outside Zebilla, Bawku West District. Training | Apart from the initial training, many volunteers have received no other training. Some volunteers participate in district level training designed for AEAs, but their invitation to these events is dependent on the AEAs and the director of their district. All the volunteers that I spoke with expressed a desire for ongoing training, offsite and on-the-job. This would most likely also help increase the motivation, accountability and incentives for the work they are doing, as training provides them with knowledge and skills to play their role well and shows them that they are being invested in and taken seriously as volunteers. All the stakeholders I spoke with expressed a desire to increase the training in the programme, the will is there, the problem is funding. Volunteers are unpaid. Occasionally they will receive a small recognition from MoFA when the districts have extra resources. Some districts have put in place an annual award for the best women extension volunteer in order to recognize their contribution. When talking to the volunteers, many express a strong desire to contribute to their community’s development, showing a strong sense of volunteerism. Moreover, when they participated in the initial training, they completed an oath, committing to use their training and energy in order to contribute to local development. However, incentives and motivation continue to be a challenge for some volunteers. Displaying the oath that all the volunteers took at the end of the training. Committing to working for the benefit of their communities. Project-environment | The reality of the Northern regions of Ghana is that people in communities and in local institutions are used to development projects, their cycles, incentives and expectations. They come and they go. This makes it a challenge to implement an operational, institutional and sustainable change that is not within a project cycle and not aligned with project incentives. It is an attitude and behaviour shift to have a role and responsibilities that are outside of this environment, which presents a challenges to how the WEV model is perceived and its long term sustainability. Strengthening Farmer-based Organizations (FBOs) | One of the important roles that WEVs play in their communities is to strengthen FBOs. They work directly with FBOs on a variety of projects and initiatives, usually playing a leadership role in the group. Many WEVs that I spoke with indicated that their groups had been failing before they went for the extension training and started to work to strengthen the groups. These groups are important for mobilising farmers, sharing challenges and lessons learned, getting access to credit, working with NGOs and projects, and running group farms. Alice with one of her farmer group. The main issues discussed at this meeting were a recent flooding of a nearby river and the steps they need to take to acquire a shea butter processing machine. Liaison |One of the most significant roles that I saw the WEVs play is as a liaison with MoFA and other NGOs. They act as a contact person in the community for the farmers, particularly for farmer groups and female farmers. If there is a new project or initiative, MoFA will often direct them toward the WEV as the gateway into the community. Similarly, if there is a challenge or question in the community related to agriculture, it is often the WEV that is the first point of contact and who will liase with MoFA to address the issue. 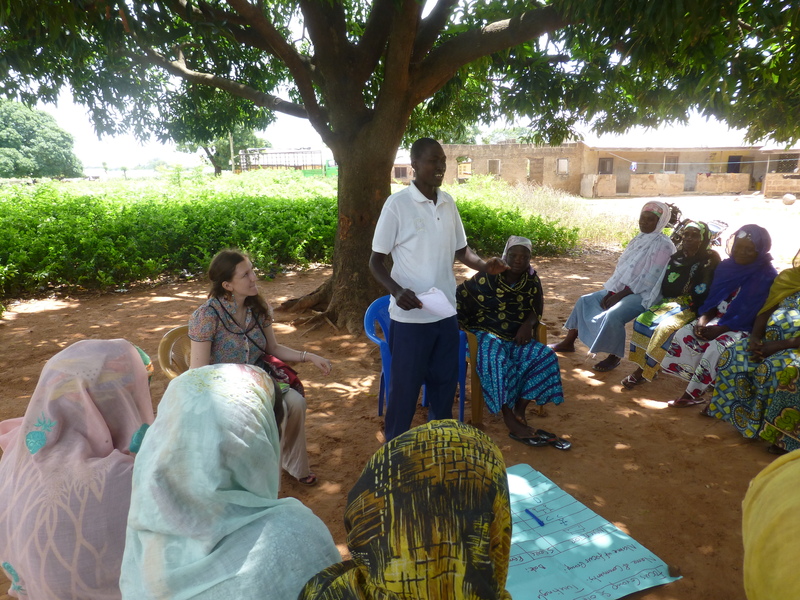 An NGO attends a farmer group meeting to do an evaluation of a recent project in the area. Bintu (right of the facilitator) is the group’s woman extension volunteer. Individual Empowerment | The volunteers that I spoke with often mentioned that what they appreciated most from participating in this initiative was an increased confidence in themselves, their roles in the community and their contribution to the development of Ghana. This blog post represents reflections on research that I am in the process of completing on the women extension volunteer model in Ghana. This research is part of my EWB ‘immersion period’ designed to help me gain experience and context working in extension, districts and with farmers. The research will be shared on this blog, with MoFA staff and with VSO. I anticipate that it will also be published with MEAS as a lesson learned case study. Thank you for this, I am really excited to see the full case study. Also kudos for pursuing MEAS opportunity. Do you think the opportunity is still up with AAB? I did not come across any women extension agents when I was in Ghana, but this sounds like a great way to open up doors for women to share their leadership and improve extension services. Do you think women extension volunteers are better able to connect with women farmers than male extension staff? 1. Let males of households participate in program to overcome male advisor/feamle farmer issue. 2. Allow single women to be WEVs as they can spend more time with farmers, can travel in far-away districts. 3. Provide monthly stipend and reimburse o.o.p expenses. 4. Send WEVs on one week agri course at regional vocation school to enhance knowledge. 5. Can program include assisting farmers to sell produce and/or to create a farmers cooperative.